This Cushion Grip Razor Scraper has a soft grip for safer and more ergonomical comfort and ease of use. This handy retractable razor blade scraper contains five standard single-edge razor blades. 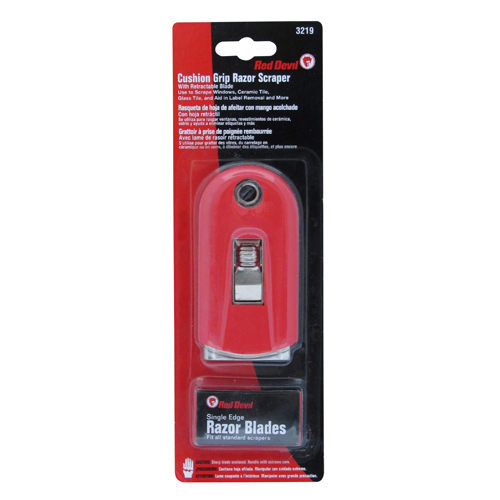 Its simple push-pull action exposes the razor edge for scraping use and retracts it for storing purposes. Step One: To extend or insert new blade, simply depress button and slide forward. Step Two: To remove blade, carefully align tip of blade to edge of flat surface. Blade will slide to side and disengage from handle. 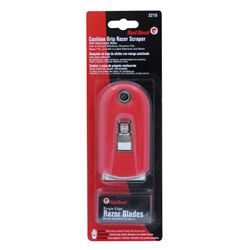 To insert new blade, align back of razor blade into the groove in handle. Push down against flat surface to slide blade back into position. Always keep sharp edge of blade away from fingers.